Free download Legend of Success Joe game for PC. 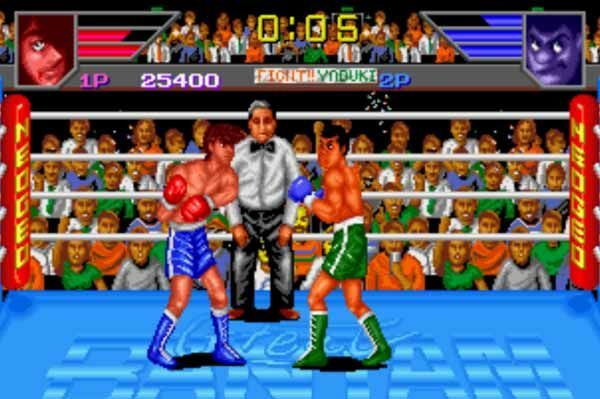 It is a boxing video game developed by Wave Corp. Legend of success Joe was developed by neo geo. You can play the game with the help of Mame32 or WinKawaks simulator on your PC. Legend of Success Joe is very light weight game. You can download the game from the download link given below. After downloading, follow the method given at the end of the post. In Legend of Success Joe, your player starts with a beginner boxer. He has to defeat some street boxer at the first round. It is very easy for your at the first round to defeat all street boxer. After that, you have to fight with a professional boxer in the ring. This will become some difficult to defeat him. When you will defeat, you will become a professional boxer. At the next round in Legend of Success Joe game, you have to fight again with some skilled street boxers. After defeating all of them, you have to fight again within the ring against some high rank boxer. Similarly, you have to pass all rounds and continue. To hit the punch, you have to use A button from keyboard. To block the attack from opponent, you can use B button from keyboard. Arrows keys are used to move player Up, Down, left and right respectively.